As we promised, and just in time for Arbor Day this Friday, we’re going to take a trek across Dutchess County. From here at Hilltop House Bed and Breakfast in Amenia, NY, to the easter shore of the Hudson River. We will visit five gardens, one here in Amenia, two in Millbrooke and two in Hyde Park. Gardens as interesting if not more so, than pre-opening Broadway plays. For those who love gardens, every season is a wonder, and the changes in budding, to blooming to off-season quietude offer visitors great insight and real time in-the-moment experiences. So “best times to view” aside, take the risk and get out to herald in the season. 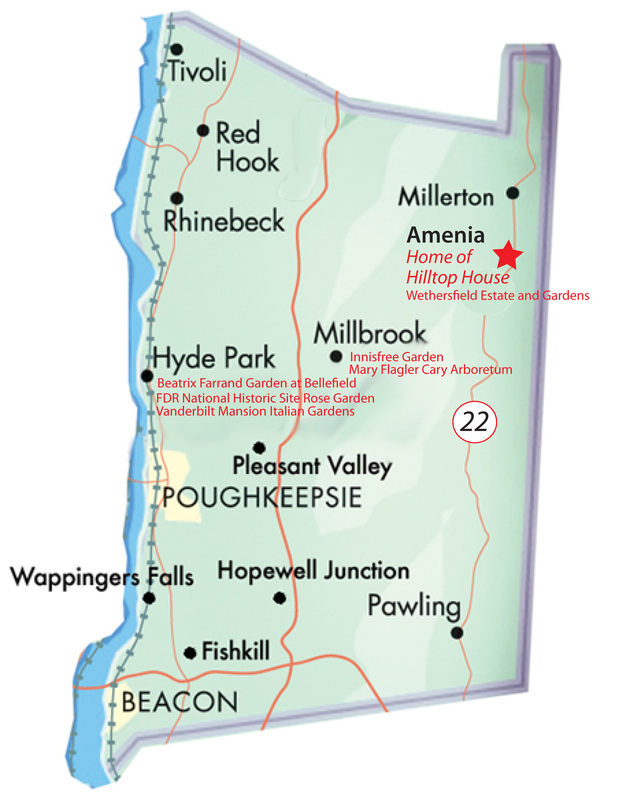 Wethersfield is located in Amenia, NY at 214 Pugsley Hill Road. It was originally the country estate of Chauncey Devereux Stillman (1907-1989), left to Homeland Foundation, a not for profit organized by Mr. Stillman in 1938. After Mr. Stillman’s death in 1989, Wethersfield was opened to the public for open space and scenic enjoyment. Mr. Stillman named his farm after Wethersfield, Connecticut, where his ancestors had settled in the late 1600s. Wethersfield House Museum, Gardens, Carriage House, and Farm. The House, Museum, and Gardens are situated at an elevation of 1,200 ft., the highest point in the region, which provides panoramic views of the Catskills to the west and the Berkshires to the north. $12 per person, $10 Seniors and Students 13-18 years of age. Advanced Reservations are required to tour the buildings. Children ages 12 and under are free. Happy Spring. It’s getting here; so I’ve been searching ways to entice it along a little faster. I came to a great website that listed all the gardens one could visit in Dutchess County and decided that every few days, I was going to write up a portion of Sandy’s Veritable Garden Tour across Dutchess County, since Hilltop House holds the eastern-most border, it’s a dandy spot to start or finish. Or maybe start and finish? Our trip takes place across Rte 44, less than half a mile away, (for some reason, Rte 44 doesn’t show on this map, but just follow our red lettering and take our word for it, it’s there. Rte. 44 turns west in Amenia, having snuggled up to Rte 22 South from Millerton to our north, then chugs up a hill and lopes gently (after that hill which is not gentle at all) through horse and cow farms till it hits Millbrook which we’ll skip for now but is the second stop on our traverse. It ends its meandering through Dutchess County, at Hyde Park on this side of the Hudson River, where we’ll end our jaunt. I’ll post the first of our garden visits in a few days, when we will tour Wethersfield Gardens, right here in Amenia. Come and visit us soon, we have lovely places to visit very close by!